Across 2 Cultures - Cross-Culture Parenting and Lifestyle Blog: Biker girl? 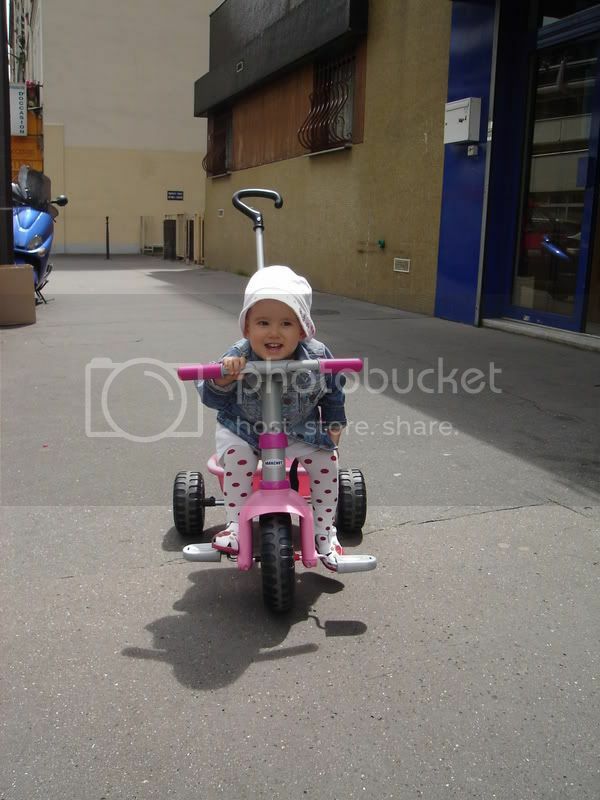 We bought Laetitia a tricycle during the week and finally managed to take her out in it when the weather was slightly more decent (a little sunshine and no rain). She loves it and is constantly trying to get on it and then shouting "AU REVOIR" (goodbye) and pointing to the main door. The only thing is, she is still a little short for the bike and therefore her feet could not reach the pedals. At some point as I was pushing her along, one of her foot would touch the ground and she would drag her foot along. I hated that especially when it is destroying her lovely shoes at the same time. So I was constantly telling her "Laetitia, your feet please. Lift them up!". Hopefully she will soon be tall enough to really learn to ride the tricycle by herself (before summer is over). OMG she is so precious! !